Today, is the first that I've been back in my studio since last Wednesday. The weather is really warming up and although things are starting to melt, we have still tons of snow! It's still great to get out on the trails and I've been taking advantage of it. This morning my son in Nova Scotia sent me more pictures of him surfing in the Atlantic Ocean near Lunenburg where he lives. Can you see the land in the background with line of snow? Aren't the colors in the water extraordinary? So, instead of typing up an artist statement for a piece that I'm submitting or working on the surfer from last week, I had to look in my stash to see if I had any colors of fabric that would work. I don't often dye fabrics and with no fabric shops nearby, I rely on my stash for my fabrics. I think this piece is doable with lots of thread play and maybe some netting over the background to subdue it. This is just me playing with strips of fabric. Sometimes I have to see if it will work before I start cutting out the the actual shapes. My next step will be to trace out what I can see as separate shapes of fabric on fusible and then layer it over the interfacing. The next two weeks are short weeks with the Easter holiday. My daughter is coming for a couple of days and hubby is taking Friday and Monday. I've got a trip out of town with a friend on Wednesday. My head however is stuck in the clouds, or should I say waves; I'll be thinking about it all time until I can get back in here. Hubby is home this week and will shortly be home for dinner. I've got to go get something ready. I had root veggies roasting in the oven just now, and almost forgot them. I'm pretty sure that today is one of the nicest days we've had for some time. Sunny, warm and springlike. I've got another line of clothes out since yesterday's dried perfectly. I even washed two pillows in my front load machine following an article I saw somewhere, maybe Pinterest. I didn't save it. I just remember that they used dish washing detergent as one of the cleaners. I added Oxyclean. They're now hanging on the line looking lovely and white. Despite the gorgeous weather, and though I was sorely tempted, I opted (really the pain forced me) to give my sore hip and leg a rest and stayed inside to play with fabric and paint. First, I painted a sky for the piece I want to do with surfer from pictures my son sent me. I cut out a few pieces in what I think will be the colors for the water. I've laid it all out and I have a picture of where I want it to go. Can you see it? I'm pretty sure I'll be painting another sky. It's not quite what I want, but at least this one will be usable in a future piece. Some of the water shapes may change as well, but it's a start.As usual, there will be lots of stitching once I'm happy with the basic underlying colors and shapes. Some of those will change too. And as you often see with big waves, there is a lot of white froth and foam. I've come across some different ways of doing it, so I'll be experimenting there too. I'm out of my comfort zone; it is a challenge that will occupy me and my thoughts for a while. 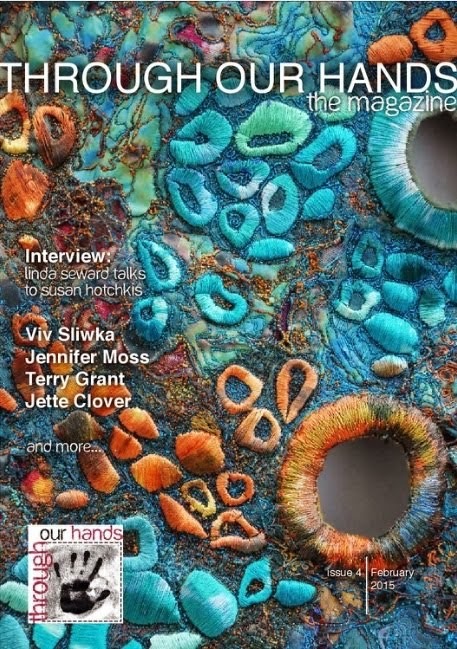 While I was at my painting table, I also did background fabric for more birch trees using the shibori method that I wrote about in Quilting Arts April/May 2013. Here is the first piece still moist and wrinkled. Now it is dry and I've ironed it. The background is a marbled batik that I pictured as a sky and forest on a spring day when I bought it.The blue runs down into the bottom (forest floor) so I'll have to do some strategic appliqueing and stitching. It will go on my design wall to think about while I work on the surfer. The next piece I did on my usual mottled gray batik. I will be using it to do a demo piece for a workshop that I am teaching the end of April. Can you see birches in there? I've made a list and I'm slowly crossing off the items. Do you do that? Sometimes, I get so wrapped up in worrying about remembering every little thing I want to accomplish in a week, that I keep circulating it all through my head in a continuous loop. Making a list stops that process and I can relax. The second shanty piece that I'm calling Shanties in Blue was on the list. After getting out with my friend, Alma, on our usual circuit on our snowshoes this morning, I had lunch and tackled a couple of things on the list-- made a phone call, got a package ready to mail, (yes, the giveaway), and then I moved into the studio. I got the backing, the binding, and the label on --just need to hand sew it back. It measures 9 1/4" by 11 3/4". I quite enjoy doing these. I like the size, the colors in the winter landscape, the small, sometimes wonky buildings and the idea that they go away and come back the next year in a different configuration. More next year. I feel productive. Now I can take a break before I run to the grocery store and the post office. I'll get right to it and announce the winner of the giveaway in the last post. 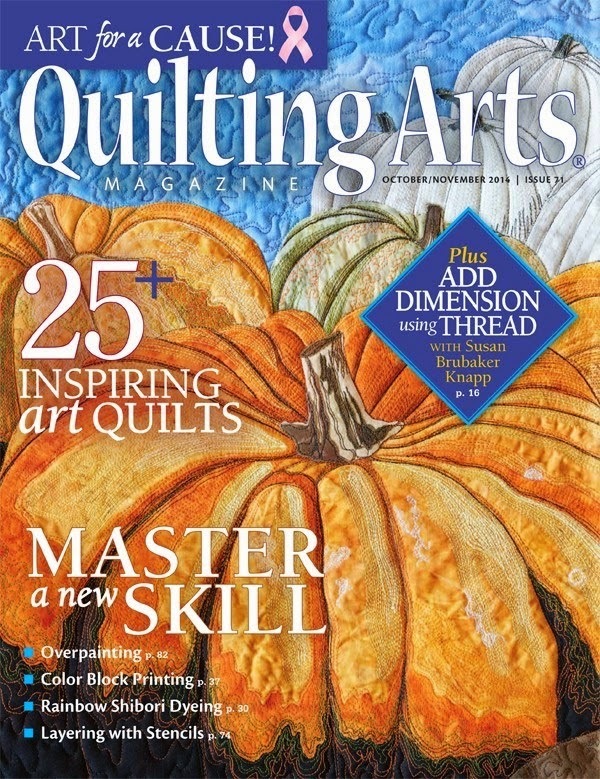 Congratulations to Linda H for winning my giveaway-- a copy of Quilting Arts magazine with my article, a fiber art book mark and a package of Swatch Buddies. I can hardly believe it. We are in the midst of another winter (in the spring) storm!. At least I decided to take advantage of it, getting a chicken bouillon (my husband may be coming down with something) done this morning, freeing me this afternoon for some quilting. No visiting in laws today. It is snowy and blustery. It seems I've been taking a lot of handwork lately to our quilting days every second Saturday, and I haven't been able to get my X's and O's baby quilt quilted. Today is a good day for it. The plan was to stipple the whole thing, quick and easy right? Then I sat down to the machine with it and completely changed my mind. I worked out a pattern that I could follow from side to side and vertically with free motion. I didn't trace it; I'm not worried about perfection. It's hard to make out how the pattern works up. It sort of looks like petals. Here is the back. You can just make out three petals in the center top area. I haven't finished all the lines yet. It will take a few sessions as I need to rest the shoulders and arms. The handwork that I mentioned above was to sew back the bindings on my recent fiber art. I finished this piece with an orangey binding to match the rosehips. You've seen it before, minus the binding. Before Christmas, it was purchased by a friend who had to think about whether she wanted it framed or bound. In the end we chose a binding. I think it suits. Now on to my next piece. I really wanted to do something bright and springy, maybe tulips, but this has been calling to me. My son sent me some winter surfing pictures from Lunenburg, NS. Yes, can you believe they surf the Atlantic in the winter? I've drawn the plan and chosen some fabric. surf and sky with a tiny surfer. I've never done water with waves before so I've decided to keep it small. I do need to paint fabric for the really pretty soft wintry sky though. That may take a few tries to get what I want. It just happens to be International Quilt week and to celebrate, The Quilt Show featuring Alex Anderson and Ricky Tims has opened up the on line shows to watch this weekend. This morning, I watched one with Mickey Lawler demonstrating how she paints her skies. I have her book, but I did get a few more tips. It's a bit late to let you know this, but try it out if you have time while it's free. It only takes a few minutes to register and the nice thing is that you will get an email to let you know when it's on next year. It has recently come to my attention that I have surpassed 1000 posts here on my blog. I passed my blog-aversary in the fall and have been meaning to have a giveaway ever since, also in celebration of my most recent article in Quilting Arts. Better late than never, as they say. 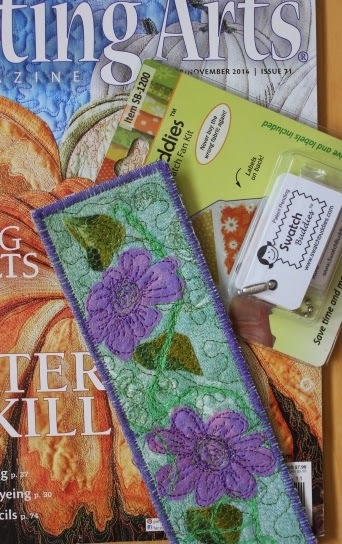 I'm giving away a copy of The Quilting Arts magazine, October/November 2014 issue which has my article in it, a fiber art bookmark made by me, and a package of Swatch Buddies which I discovered before Christmas and gave as little gifts to my quilting friends. The Swatch Buddies are a neat little system of tags on a key chain to which you can affix fabric samples if you're going to the quilt shop looking for matches. To enter leave a comment. I'd love to know if you're currently reading a good book or have one to recommend. I will leave it open until Saturday 7:00pm EST. Yesterday, a commenter asked if I wouldn't post more detailed pictures of the rocky piece, so at the risk of boring some of you, here they are. This is the bottom left corner. The picture above is an area in the top right. Since I had promised another friend, I went again this morning for a snowshoe. After the winds yesterday, there were lots of little bits of flora on the trail which I couldn't resist bringing home. I've added a couple of the pretty finds to my table center, a habit I got into last summer. 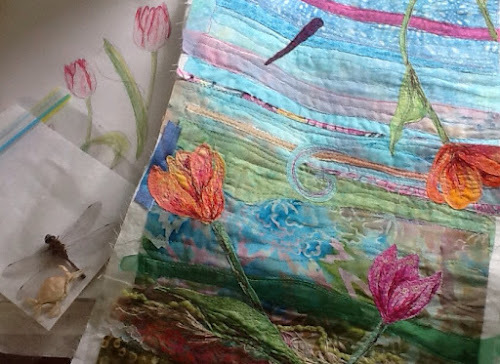 I rested up after lunch with tea, a blanket and a crossword puzzle for a while and then I passed some time working on the fiddly finishing touches for several of my pieces. My current label technique is to print out the labels onto printer cotton, cut them up and sew them to the back corner when I stitch on the binding. I like to add my signature as well. Yes, I really felt it today! My back deck thermometer says 6C, the first day above 0 in quite some time. My friend and I went for a nice long snowshoe (I required a bit of an ice pack once back home). It was worth it; what a beautiful day. It put me in the mood to sketch tulips, and at least I could do that with my feet up! It's definitely time to move from winter scenes to spring scenes. I picked the tulips up last week; they are pretty wilted, so I did a quite gestural sketch. Yesterday, I was determined to finish my Tetagouche Hill piece, and I did. It surely helped that I didn't have to stop to make dinner being on my own this week. I got it done (I'm calling it done, making myself stop), backing and binding on. All that remains is to hand stitch back the binding and add a label. Here is a look at the back before I sandwiched it, finished the quilting and added a backing. A lot of thread. In my kitchen today, I have my sprouts ready to eat, chick peas cooked (they are so much more tasty than the canned ones) and some pea shoots just sprouting. I will use a few of the chick peas, freeze the rest and take a them out as needed. It's the first time I've tried growing the pea shoots; now that I see how easy it is, I'll do more. They're delicious on a salad and oh so much more appreciated when you've grown them yourself! A good start to the week. I hope your Monday is just as nice as mine. I know it's not for a friend of mine who has come down with the flu/cold. Take care, feel better soon. 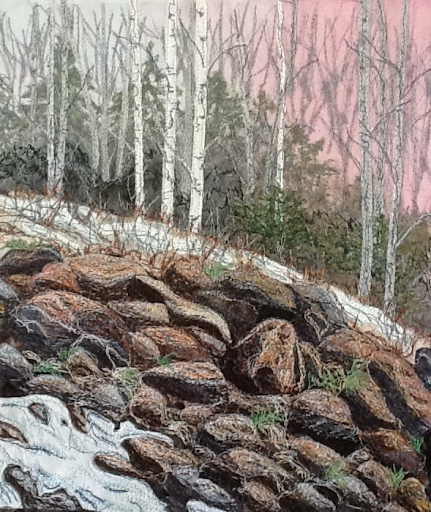 I've been stitching away on this piece for the last couple of days, adding shades and high lites to the rocks. I'm still not sure about it but at some point I have to call it done. When I put it up on the wall or here on the screen, I see little areas that I want to improve. The photo was taken with my I Pad as the camera battery just quit. Right now it is heavily stitched and backed with a very stiff interfacing. I think I'll add Timtex to the back and anchor it with some stitching, finally binding it. Despite being under six feet of snow, spring is in the air and on my mind. I've got ideas that want expressing! I'm writing this on my IPad as my keyboard on my computer was not cooperating. Therefore, I took the pictures with my I Pad, so they're not the best. Today is one of my errand days, so I was out this morning, but home at lunch time. I've had a nice hour or so in my sewing room and now while writing this, I'm grabbing a snack and getting ready to go to the spa for a swim before picking up hubby. This is what my sewing table top looks like. I'm in the mood to start another quilt and I'm trying out a block. 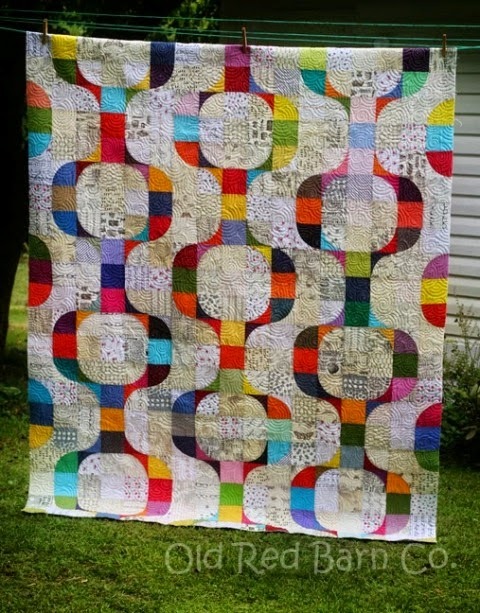 Have you seen the swoon blocks and quilts that have been popular recently? I started to cut and arrange the fabric, but stopped when I realized I need a detailed plan. I'll draw it out in my graph book. So then I moved on to do more thread painting on the tulips adding more of a range of colors. I like to keep my reference photos, sketches or specimens close by while I'm stitching. 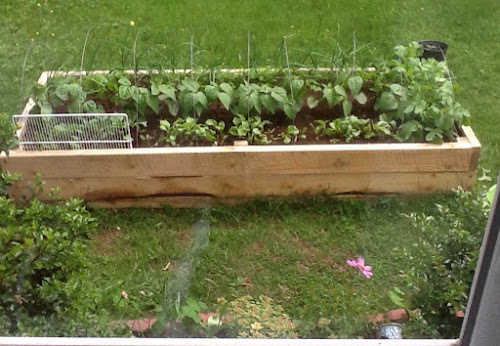 Occasionally, I glance out at my garden when a movement catches my eye. 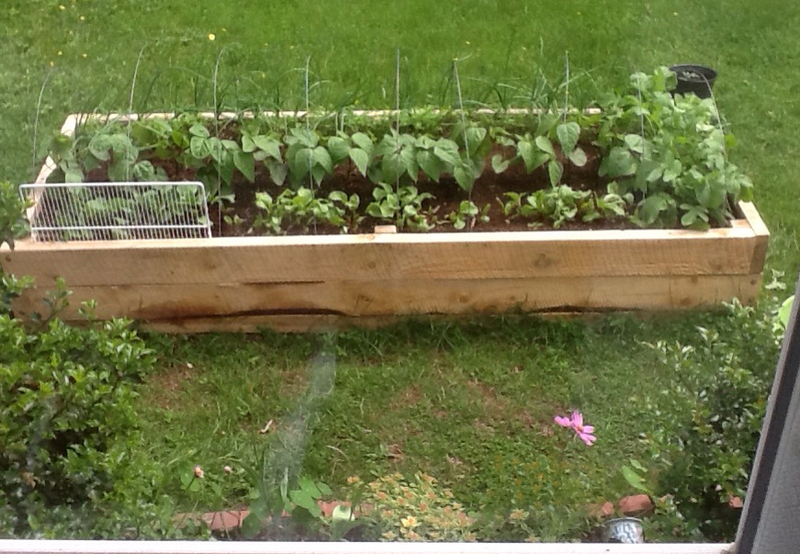 The raised bed is filling out. I enjoy being able to look at the whole yard from my studio. 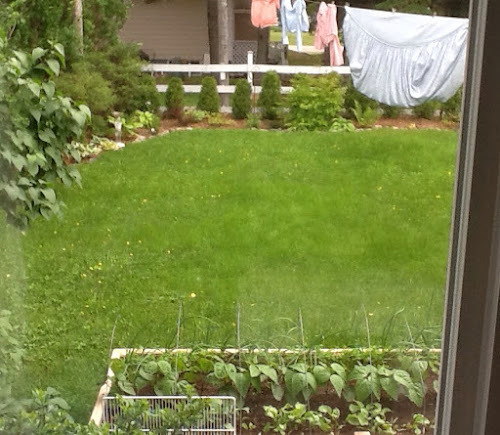 Even the clothes on the line make me happy. My yoga teacher is away for the month of March and my friend and -- the one I snowshoe with-- have decided to do the class together each week. Today, we did here. We had lunch afterwards which was nice. You'd think we'd run out of conversation, lol, bit we never stop. Afterwards, I went into my studio determined to at least finish one of the shanties pieces. I got the quilting finished and the binding on the one with the pink border. It measures about 9 1/2" by 11 1/2". I will be out for part of tomorrow but hoping to finish the other one too. I've got spring colors and flowers on my mind even though we're still buried under snow. Our March weather holds signs of spring, and since our snow banks are so high, what better time than to climb atop them to do some tree trimming. Our apple tree was overgrown with too much top growth which we cannot reach in the summer. Yesterday morning, my husband and I climbed the 6-7 foot snowbanks, donned our snowshoes and went to work with the saw and pruners. The pathways around the yard seem almost like tunnels. We couldn't do it all yesterday, so I went out to do some today. The weather is supposed to be good all week,so I'll get a bit done each day before the banks go down too much. This is the before picture this afternoon. I managed to get the large trunk in the foreground off. There are 2 left to do. I have both shanty pieces bordered and backed with Timtex. They are small enough that I thought the firm backing would work nicely. This morning, I did a bit of the quilting on each of them--just enough to high-lite some areas and anchor the piece to the Timtex. 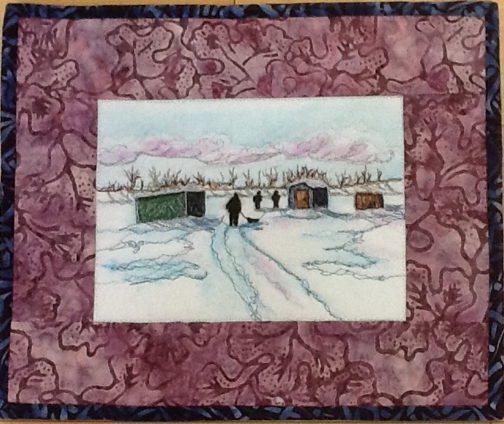 I will go around the shanties, the men and quilt the borders if I can stay inside long enough to do it! I've settled on a pattern for my next quilt and I printed it out this morning. It's called Mod Pop. Here is the picture of the one done by the blogger from Old Red Barn Co. I plan to use a low volume background but I will choose a color scheme for the 'pods'. Wow, it's been 5 days since I posted here--unusual for me--unless I'm away which we were supposed to be. I felt like I was coming down with the cold and didn't want to pass it on to anyone, so we stayed home. Despite it being a guild quilting day, I opted to spend the day at home, and even though it's a gorgeous day here, I didn't even go snow shoeing which I've doing almost every day. The days are getting longer, brighter and warmer, and with all our snow it's wonderful for winter sports right now. Anyway, I needed a domestic day. Also, I've had a couple of quilting projects that I've been lugging to all my quilting days and retreats and they were calling to be finished. This morning, I added the last borders on the garden fence quilt. It fits my bed perfectly and the color in my bedroom is perfect with it. When I travel for the SAQA retreat in April, I will take it to get it machine quilted. After lunch I made a half size rhubarb crumble for my husband and I from the rhubarb I froze last summer. Then, I sandwiched this x's and o's baby quilt. I will quilt it myself, but plan to take it to our next UFO day for that. I feel better now that those chores are out of the way so the next time I sit dwon to my sewing machine it will be to work on my art pieces. I actually have almost finished my two little shanty pieces but didn't photograph them yet. I can't leave without adding my bird photo of the day. our deck and yard has been teeming with many species of birds. Recently the waxwings moved in to finish off the few dried apples left ithe tree. I didn't think I'd have time today, but I'm just popping in for a quick note and a few pics. Now that March is upon us, the temperatures are slowly warming and the days are getting longer. All the snow that has been dumped upon us is at least good for something. Perfect really, and I plan to make the best use of it in the next few weeks. I was out snowshoeing 4 times last week with a friend and we have plans for this week too. 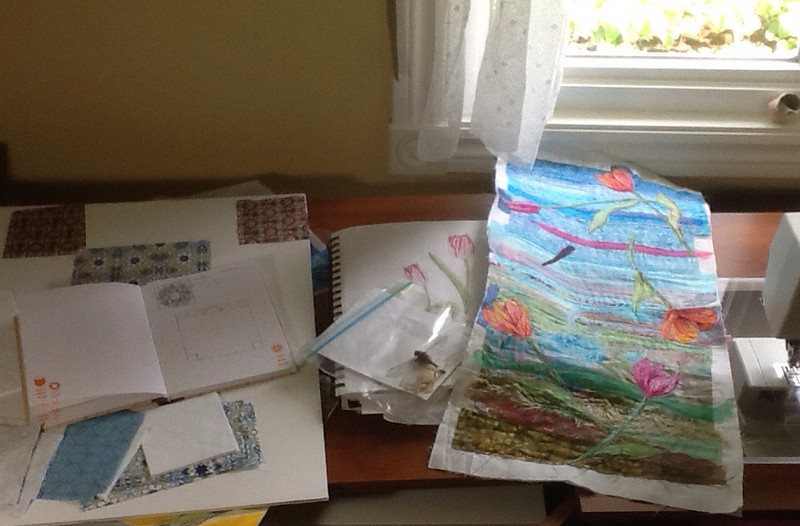 Today I had a couple of quilting friends over. Carmel has been wanting my help to get an art quilt started based on a photograph that her daughter gave her. She got the design done and the main pieces cut out. She went off with some directions to how to proceed and I'll help if need be. 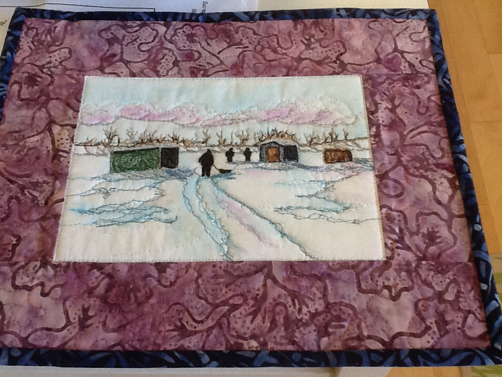 Then, I had a bit of time to add borders to one of the shanties along with a bit more stitching. I still have a bit of white to add. It measures 5" by 7". I often have to think about whether I want to border a piece and sandwich it or put it in a frame. Perhaps a frame would suit or even enhance it but I still seem to go for the traditional fabric border, batting and backing. I've added the borders and if it sits well with me, I'll sandwich it and quilt some of it. If you miss me here, know that I'm outdoors enjoying the sun and the snow.